When a company creates an input accessory for a device that isn't designed for one, they need to decide what the accessory is going to do that the device's normal input method doesn't. The iPad was designed to use a finger as an input device, and although it supports multi-touch, the iPad's sensors see the finger as a rather blunt instrument. 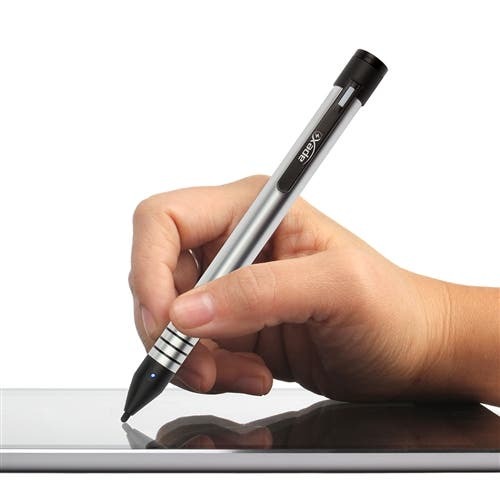 So the stylus market developed with two main branches: The first aimed to be a different or better kind of finger and the second added a feature, usually pressure sensitivity, that the iPad was not designed to accept. This review looks at two styluses, each in the better kind of finger camp. The Lynktec offers a new twist, however, with its fine-line active technology, while the Nomad Mini 2 provides its users with a basic rubber-tipped stylus along with a brush. Most active stylus products that connect to the iPad with Bluetooth do so in order to pass along output from their pressure sensitive sensors to the app in use, usually a drawing app or note app that would benefit from more than constant and singular pressure. But then again, sometimes a fine line is a good thing, when taking handwritten notes. Words written by hand don't really benefit from pressure sensitivity, but they do benefit from precision. With its 2.3mm tip, the Apex provides a fine line that can't be mimicked with non-active styluses. Unlike regular rubber-tipped styli, the Apex doesn't work without power. The capacitance requires power, but not Bluetooth. And because of the fine tip, it only reacts to the iPad where the tip touches, which is the key to its precision. This is not a good pen for artwork outside of basic sketching; but because it doesn’t require Bluetooth or apps specifically designed for it, the Apex works throughout iOS. Slow drawing can lead to some squiggly lines, but according to Lynktec, that is because the iPad's screen sensors are less precise than the pen. Innovation often leaps and needs other innovations to keep up. Draw faster and the software smoothes out the input from the sensor grid. Permits fine-line note taking on the iPad. Rechargeable battery. Pocket clip. Works everywhere in iOS. Requires charging. Recharging requires removal of a cap that doesn't have anyplace to go (and thus can be lost) during a charging cycle. Could use a softer grip. Not really made for iPhone. A very well executed first gen product. The tech is solid, but it could use a little bit of style refinement and sculpting for better hand feel. The Nomad Mini 2 has a soft, retractable brush tip on one end and a rubber tip on the other. At 5 inches long, it is a very portable paintbrush stylus. The Nomad Mini 2 weighs 0.6oz. It curvy shape feels well balanced. The rubber tip can easily be unscrewed and replaced. Small, light. Dual tipped. Retraction keeps brush from fraying. The brush is a cool idea, but it's more about the feel for the artist than it is about the way it reacts with the iPad. For real "paint-like" effects, the artist will need an active, pressure-sensitive stylus and a painting or drawing program that recognizes it. Good for what it is. As with all iPad brushes, it is cooler and more useful as an idea the in actual practice. It really depends on the experience you are used to or like.